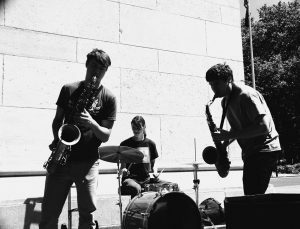 Moon Hooch is a Brooklyn-based trio made up of James Muschler, Mike Wilbur, and Wenzl McGowen. The three first met while attending New York School for Jazz and Contemporary Music. 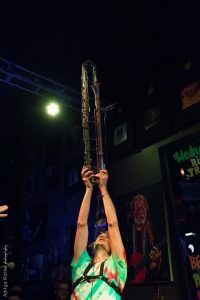 The band’s unique sound, crafted by a simplistic combination of two saxophones and a drummer, combines elements of jazz and funk with dance music. Moon Hooch first starting playing together as buskers in the New York Subways. Apart from their incredible talent as musicians and performers (as proven by their energetic set at Hendrix Hat Trick Festival) each individual brings a unique background of interests and skills. 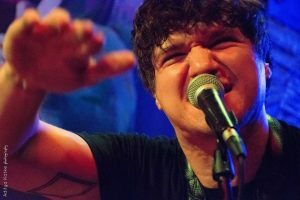 It is the overlap and combination of these interests and talents that distinguish Moon Hooch from other musical acts. As mentioned before, Moon Hooch was birthed in the underground caverns of the New York City Subway System. But to analyze the band just as a whole would be doing an injustice to both the individuals and the authenticity of the band. James Muschler, on the drums, is the backbone for the band; providing a driving kick drum and timely fills which provide a catalyst for the music. Contradictory to his energetic and almost angst driven drum lines, Muschler is a calming spirit……… Upon arriving in Arkansas, Muschler had recently returned from a month long trip to India where he studied drumming. Apart from providing rhythm, Muschler acts as the bands chef while on tour. All three members of the band adhere to a vegan diet. The three found it difficult to maintain this lifestyle while on the road, so Muschler began packing a hotplate and spice rack next to his kick drum. His recipes became so successful with the band that he began posting them on his blog: Cooking in the Cave. Mike Wilbur, a Massachusetts native, brings a more dominating personality to the band. An outspoken individual with a lot to say, Wilbur has an energy unlike any of the other members, which translates to his performance with screeching solos and constant movement. Wilbur’s talents are not limited to the saxophone, he is also provides vocals in Moon Hooch on occasion and is currently working on a rap side project (Conway got a small taste of Mike’s lyrical prowess during Hat Trick). On a scale from James to Mike, Wenzl McGowen falls somewhere in the middle. McGowen is a laid back soul with a lot to say. Aside from playing Tenor and Baritone Saxophone and Contrabass Clarinet, McGowen has spent a lot of his time exploring his spirituality through meditation. He is currently in the process of writing a book about a spiritual connection to the supernatural, which he is going to release via a writer’s Co-Op that he started. His book was inspired by an intensive meditation retreat that required Wenzl to meditate 10 hours a day. Wenzl’s interest in meditation spills over to all the members of Moon Hooch. In fact, the band uses meditation as a way to resolve personal disputes and explore new ideas. Meditation has been critical to the relationship that these 3 musicians have built. When Mike and Wenzl first met they outright hated each other. Using meditation and psychology they worked to understand each other. In our interview each member spoke to the conflict that can arise between them and how artist collaboration has taught them to work together. Muschler spoke about the difficulties that arise in collaboration saying “everyone has their own idea of where they want the music to go” McGowen expressed the importance of being able to “let go of one’s own vision” to be able to share a vision together. Through the good times and the bad, Moon Hooch has not just endured but grown stronger. There is a connection between these three that can be felt both in their music and more notably in their live shows. Because when all the conflict is put aside, it is the passion for the music that these three share most. 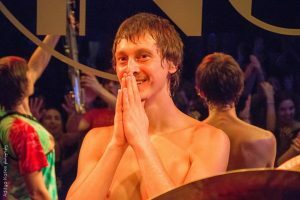 The love for their craft and the ability to harness that love on stage to connect with their audience is what gives Moon Hooch their spark on stage. Moon Hooch brought all that energy and more to the Hendrix Hat Trick Festival at King’s. Their high energy got everyone moving and even made the doors sweat with their unique fusion of Jazz and Dance Music. One hour was not enough for King’s attendees who cheered on Moon Hooch for one encore and tried for more. Looking forward, Moon Hooch has a lot planned for 2016. In April they go on tour with The New Mastersounds and although they did not provide any specific details the band mates eluded towards new music this year.